So, the bulk of the tracking of the album is complete! We’ve had 9 days of actual recording in Carrier Waves Studio with our engineer Keir. The first few days Jenn spent recording guitar and then Cammy came in and did the double bass. After a weekends break, I recorded harp. All went pretty well, though, as we kind of expected things took a bit longer than we’d originally planned. There’s always hiccups in the studio…but you learn from them! For myself, harp wise, there were a few tracks (mainly the slower numbers) where the harp was a lot more exposed and typically on those days el harpo decided to be a bit temperamental with tuning! This meant having to stop and retune after each take, sometimes even having to stop half way through a take to scrap it and retune again. 34 individual strings though, it’s just asking for trouble with tuning!. I found my first day of recording pretty stressful as I just couldn’t get comfortable in the studio. It took a good deal of time for my hands to warm up, both musically and physically. However day 2 onwards I discovered an ideal solution… hot water bottle 🙂 Just carrying around the hot water bottle before we started really helped. Mid December really was freezing here in Glasgow, so this really helped me getting on form for recording in the mornings. One of the problems we also discovered was that the close mic technique we were using meant it was also picking up my breathing and sniffing! But day 2 we came up with a solution… breathe right strips! 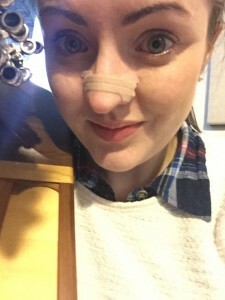 These are enforced elastoplaste strips which you put on your nose to help widen your nasel passages… you quite often see rugby players and runners using them to help increase the amount of air they can breathe through their nose. They totally worked. It stopped me sniffing and I was able to breathe freely, and importantly, silently. They aren’t the most attractive things to wear and I unfortunately forgot to remove one before going to the shops on the way home…. We spent a good amount of time getting the harp really tight in with the guitar and the double bass. This meant really listening to which sections you needed to really lock in with. For each track we did a good number of takes, really trying to get the best of the best. Sometimes this has meant recording them differently to how we play them live… so in some sets stopping half way through, and tracking each tune separately due to key changes. My starfish Glenelle harp has what I term as the best in chromatic levers on it. For you non-harpers it means every time I change key I need to switch up or down levers. My levers are really fast and pretty much silent. Certainly they’re the fastest and quietest on the market today… but… studio mics are proper, proper sensitive, so even the slightest noise changing lever was noticeable. So as a result we decided to track some of the set changes separately to avoid getting any unwanted lever noise. That might be a bit controversial to some, as we would never do it like that live, but we wanted the changes to be as clean as possible, with no unwanted noises. 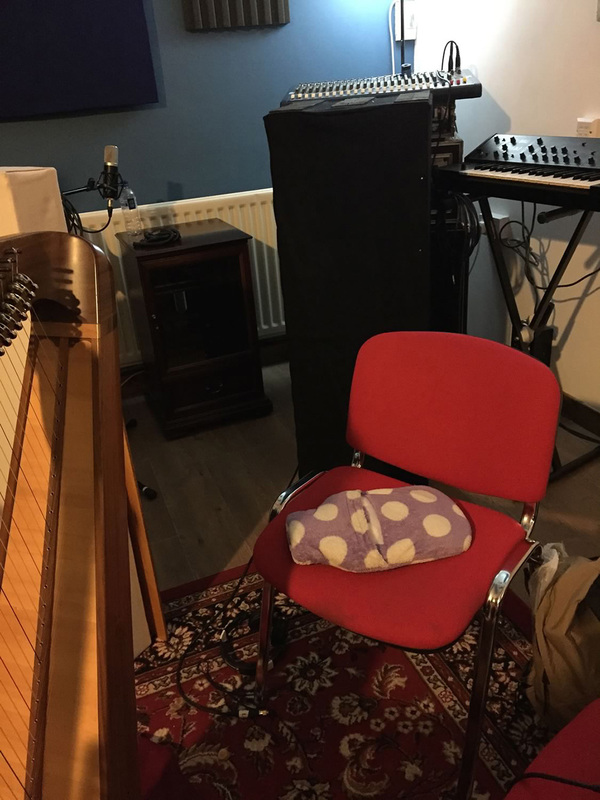 Another I guess slightly controversial thing we ended up doing was on some sets, where we had a dead stop (that means a short last note), we ended up tracking the last harp note separately and adding it on to the track. Because Jenn and Cammy have instruments with 6 and 4 strings respectively, they’re able to cleanly stop all strings and stop them from ringing on. 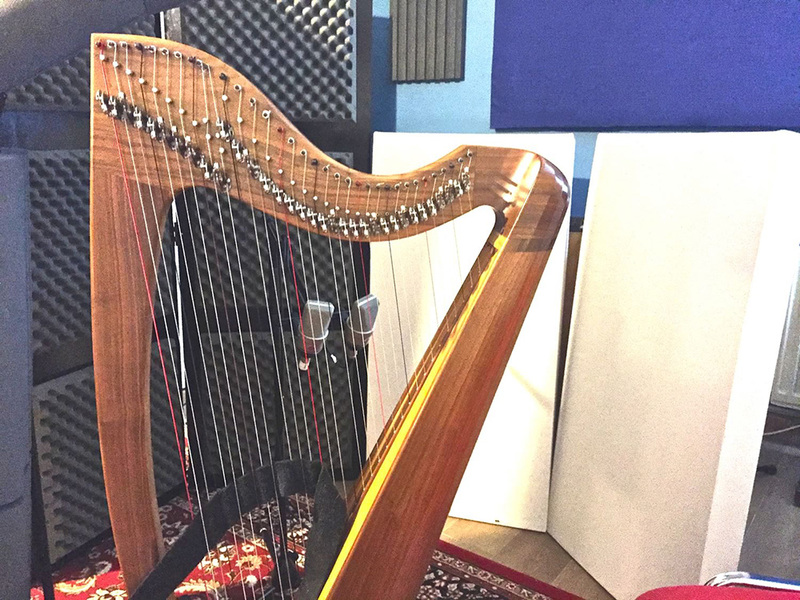 Harp though… 34 strings… my hands aren’t big enough to stop them all! No matter what, even if you don’t play them at all the other strings will resonate when you play. 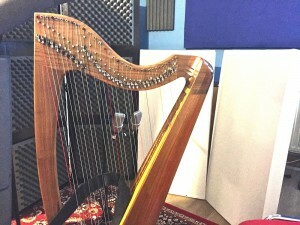 This is really what makes the harp what it is and it creates lots of amazing harmonics around it. Buuuuut sometimes you just want to be able to create the cleanest of stops along with the other 2/3s of your trio! So we ended up utilising Jenns cardigans fabric belt to weave between the bass strings, meaning they were already damped. This meant I could play the last note and be able to damp the remaining strings with my hands as normal. It worked… thank goodness! I’m at home in Scotland just now but I’m leaving on Wednesday morning to head to the Isle of Man for 5 days holiday to celebrate the New Year. Hogmanay will be spent playing tunes at the wonderful family home of young Manx fiddle player Tom Callister. Tom plays in a 1/4 of the fab Manx band Mec Lir who are playing tonight (Monday the 29th Dec) in the town of Douglas of the Isle of Man. I’m gutted I can’t be there to have what will no doubt be an awesome night of dancing to great music.